Description drugBase provides a RESTful interface to a database of drug-target interactions. drugBase is a web site and a web service to query drug-target interactions. Unlike most such databases, drugBase is gene-centric; it is designed to optimize queries of the form “Which drugs are known to target my gene or set of genes?” The web site allows you to enter queries one gene at a time. You can use any common gene identifier, including probe names from common microarray manufacturers. The web service allows you to make batch queries of the same data from any programming language that supports HTTP and JSON. To use the web service, you must use a language that can make HTTP GET calls and interpret responses in JSON format. To use the drugBase web site, simply enter any gene identifier into one of the boxes and press the “Go” button. drugBase is built using CouchDB, is an open source, non-relational, document oriented database system. CouchDB’s built in web administration console communicates with the database using HTTP requests. The RESTful JSON API provided by CouchDB allows access to the database from any environment that allows HTTP requests. More complete documentation, including how to access drugBase from perl or R, is provided at the drugBase website. All code developed at M.D. 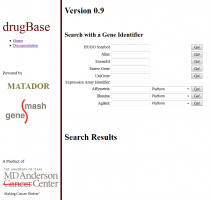 Anderson to implement the drugBase application is covered by the Gnu General Public License, version 3.0. drugBase runs inside a CouchDB database environment; CouchDB itself is covered by Apache License 2.0. drugBase uses data from the MATADOR database. MATADOR is covered by a Creative Commons Attribution-Noncommercial-Share Alike 3.0 License. 0.9: Initial public relaease, 24 February 2012.